Cambridge Audio expands Azur 851 and Minx speaker lines | What Hi-Fi? 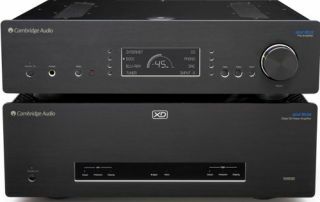 The 851E preamplifier, 851W power amplifier and 851D DAC will all be shown off at CES 2014, along with the Minx XL satellites and Minx C46 ceiling speakers. Cambridge Audio has unveiled three new additions to its Azur 851 series of hi-fi separates: the Azur 851E preamplifier; Azur 851W power amplifier; and Azur 851D DAC. It has also announced two additions to its Minx range of speakers, in the form of the XL satellite speakers and C46 ceiling speakers. All the new products will be shown off at CES 2014, with a release date in-stores planned for later in January. The Azur 851E preamplifier is an analogue device, with components individually designed to avoid interference. Cambridge Audio claims "harmonic distortion and noise are so low that they're almost impossible to measure." The 851E is the successor the the 840E. It has eight inputs in total – three are switchable between balanced XLR and unbalanced RCA. The 851W power amplifier meanwhile, is claimed to be "Cambridge Audio's best sounding amp yet". With it, Cambridge Audio claims to have refined its Class XD system, which combines the best of Class A and Class AB amplification. The 851W is fitted with two toroidial transformers and Terrapin impedance buffering modules which aim "to deliver serious levels of power with absolute precision." This results in the 851W being able to deliver 200W into 8 ohms for stereo. It can also be used in mono-bridge mode at 500W RMS per amplifier. Both the 851E and 851W are designed to work in sync with one another. The 851W has an auto-standby mode that can detect an incoming signal from the partnering 851E. The 851D DAC is the successor to the 851C, and has had the CD transport removed in an attempt to reduce noise. The 851D offers a variety of digital inputs including coaxial, Toslink optical, BNC coaxial and AES/EBU. Also on board are asynchronous USB and Bluetooth wireless up to 24-bit/192kHz quality. Second-generation ATF upsampling up to 24-bit/384kHz is present for every source. All products in the Azur 851 series can be operated from one remote control. The 851 DAC will retail for £1000, the 851E preamplifer for £1200, and the 851W power amplifier for £1500. The Minx XL satellite speakers make use of a silk-dome tweeter, which CA claims offers "smooth sound, with high levels of detail". The XL satellites are surprisingly compact speakers and will retail for £200 per pair when they're released this coming spring. The Minx C46 ceiling speakers meanwhile are 80mm wide, and make use of Balanced Mode Radiator (BMR) technology. This allows the C46 speakers to have a wider frequency response than comparable models. They will retail for £100 per single speaker when released later in January.